Missing teeth can take a toll on more than just your self esteem and physical appearance - they can also affect your oral and general health. 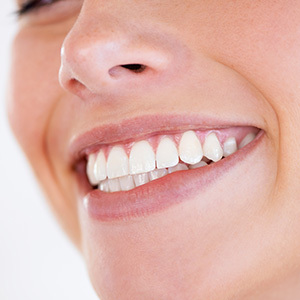 Dental implants are a great option to restore your smile and oral health. Dr. Raymond Della Porta offers cosmetic and general dentistry services in Vero Beach, FL. 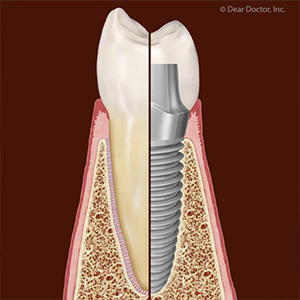 Dental implants restore a missing tooth in its entirety from root to crown. First, the implant is surgically placed in the socket of the missing tooth, where it then begins to fuse with the bone tissue in the gums through a process known as osseointegration. 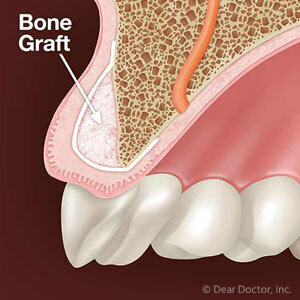 This helps to secure the implant in place, and prevent bone loss. The implant is made of biocompatible titanium and shaped like a small screw, which is attached to the cosmetic crown through an abutment. Implants are available to replace a single tooth or can support an entire set of dentures with just a few implants. Once in place, implants are virtually indistinguishable from natural teeth - they look, feel, and function just like the real thing. Implants can even make your teeth look better than they did before. However, just like natural teeth, they require meticulous oral hygiene and regular follow up visits with the dentist for check-ups and professional cleanings to reduce the risk of complications. With proper care, implants have a very high success rate. Implants are available for healthy adult patients with sufficient bone density in the gums to support an implant. For more information about dental implants, contact our office today by calling (772) 567-1025 to schedule an appointment with Dr. Raymond Della Porta. Despite all of the recent advancements in dental technology, a surprisingly large number of Americans are still living with some form of tooth loss. The American Dental Association (ADA) estimates that close to half of the adults in the United States are missing at least one tooth, with millions more missing all of their teeth. Although tooth loss becomes more of a concern with age, anyone can lose a tooth at any time, either from an oral health problem like tooth decay and gum disease, or from an accident or sports injury. Dr. Raymond Della Porta, a dentist in Vero Beach, FL, recommends dental implants for healthy adults missing anything from a single tooth to most or all of their natural teeth. Most people are familiar with traditional dental restoration treatments like crowns, bridgework, and dentures, all of which replace the visible, bottom half of a missing tooth (also known as the crown). Implants replace the root of the tooth, which helps to securely anchor the restoration in place and help to preserve healthy bone tissue in the gums. First, a biocompatible screw-shaped implant is surgically placed in the gums, where it will eventually fuse with the existing bone tissue. Once healed, the cosmetic crown is attached. Implants are also unique in that they can be used to replace a single missing tooth or to secure an entire set of dentures with just a few implants. In order to be a candidate for dental implants, you must be an adult in good health. You must also have enough bone density in the area where the implant will be placed. Implants require rigorous oral hygiene and regular follow up care with the dentist but have a very high success rate for healthy patients. If you are tired of living with gaps in your smile and want to improve your oral health, contact us today by calling (772) 567-1025 to learn more about dental implants and to schedule an appointment with Dr. Della Porta today.